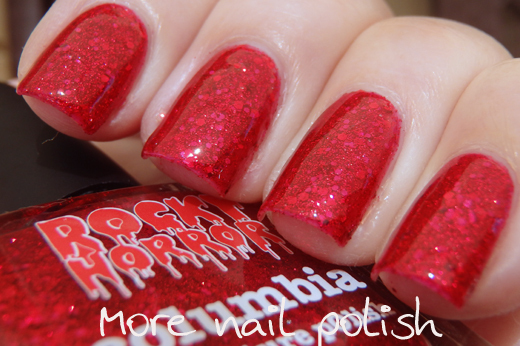 Tonight I have swatches of the Picture Polish Rocky Horror Collection, just in time for tomorrow's release. This collection of polishes was created by Picture Polish to be sold at the theaters where the Australian Rocky Horror Picture Show is touring. The show wasn't coming to my town, so grabbing a bottle was just as difficult for me as it was for someone overseas. Luckily, Picture Polish was able to secure rights to sell the polish outside of the show, which is why we are all now able to purchase the polishes online. Let's take a look. 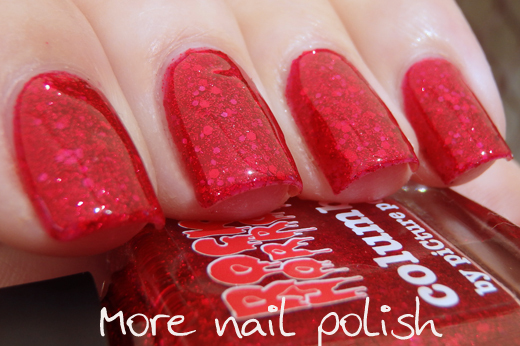 Frank-n-furter - a rich classic red crelly. Strong pigmentation and perfectly smooth to apply. This is two coats with Seche Vite top coat. Magenta - the second crelly formula in the collection. 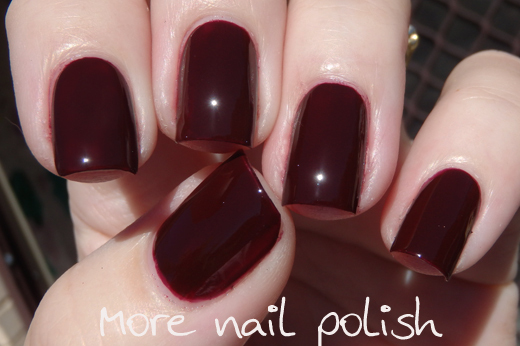 This one is a deep, dark and vampy chocolately maroon shade. This is two coats with Seche Vite top coat. Rocky - three sizes of cool toned gold hexes. The glitter payoff is actually very good. You might even be able to get it opaque on it's own at three coats. 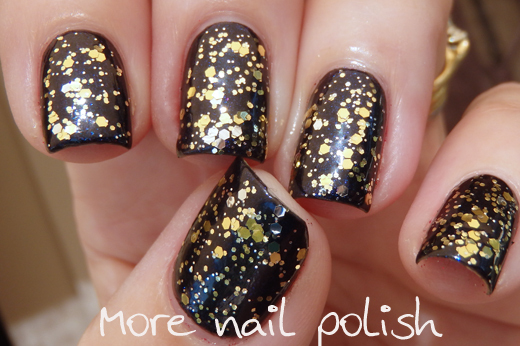 I have lots of gold glitter polishes, and this is a really nice addition. I like that you can pick out individual pieces of the large hexes if you wanted to use them for nail art. 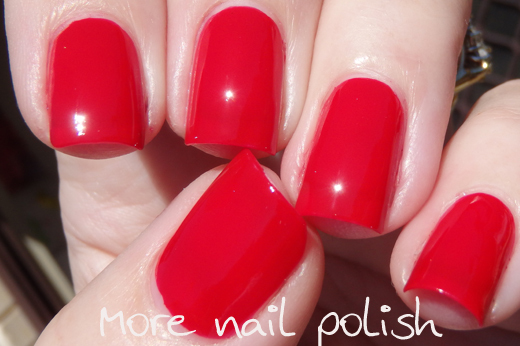 This is one coat over Time Warp, with Seche Vite top coat. 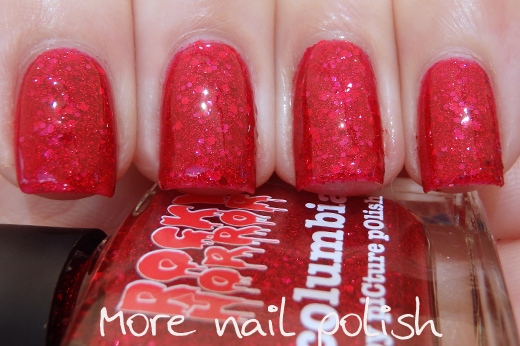 Columbia - Damn you red glitter polishes, photographing you to make you look as awesome in photos as you do in real life will be the death of me. Photographing glitter in the sun is always difficult, and I usually get decent glitter shots under my outdoor shade sail, but red glitters just don't co-operate for me. This one is actually my favourite polish from the collection. 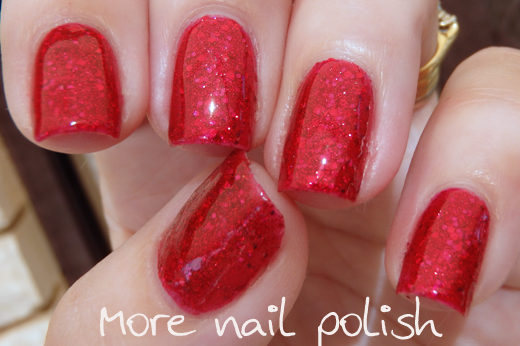 It's densely packed with red glitters of various sizes as well as red shimmer and a red tinted base. This is two coats on it's own and it's perfectly opaque. My photos make it look washed out, it's much redder in real life. Maybe I should learn to Photoshop my pictures properly so I can get the right colour. 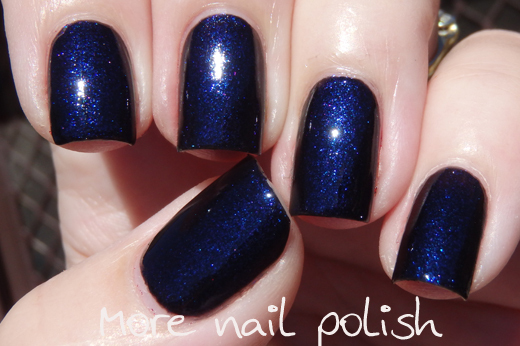 Time Warp - a very dark and nearly black looking dark blue shimmer. My photos are taken in the full sun and show of the shimmer much more that you really see in normal lighting. Still, its sparkly and gorgeous. This is two coats with top coat. The Picture Polish Rocky Horror Collection will be available for sale on tomorrow, Monday 14 April at 9:00am AEST, direct from Picture Polish. International ladies can also purchase through one of the many Network stockists. Also going on sale tomorrow is the Urban Cremes and the new Collaboration Shade Instinct by OhMyGoshPolish. Your swatches are beautiful as always! I'm really digging the glitters and shimmer! I am sorry but in my books Magenta should actually be magenta! The colours are very nice though. I like, and want, them all! I think it would be fabulous to have them as a set in some funky, funny packaging.